My Vacation in Crawford Notch – Planet Geek! I’d been thinking of doing more camping and backpacking and hiking along various trails and mountains in New England for a while, and after a few saunters up Wachusett and Monadnock, I was primed for something a little more adventurous. My next real camping goal is to spend some time in the huts that AMC provides along the Appalachian Trail. The huts are somewhere between a campsite and a lodge – high up in the mountains with basic facilities (like a kitchen and bunk beds), but hardly high living. Going to a hut in early winter seemed something of a longshot, but it would be a nice option if available. I settled on reserving space at the Highland Center Lodge in Crawford Notch, NH. The AMC maintains several lodges throughout New England, Highland Center is the newest, and I liked the location. I scheduled things up to stay there from Sunday night to Friday afternoon. By myself. Want to be clear here. I was not “up in the mountains camping by myself”. The lodge is fully staffed and quite comfortable. By ‘hiking’ or ‘camping’ standards, it’s the Ritz Carlton, with a fully staffed kitchen and dining hall, a great outfitters shop, a gear rental shop that carries just about everything, heck, they even have free Wifi. For the standard hotel traveller, it’s pretty rudimentary. Rooms are very small and sparse, soundproofing is limited, bathrooms are shared (though some private bathrooms are available), etc. The lodge caters to adventurous folks who are there to go climbing and hiking. There’s very little else nearby — at one point I realized I had not brought any toothpaste, so I asked at the front desk where the nearest small store would be, like a CVS or something. They sort of looked at each other and guessed 20+ miles “they might have something there. What are you actually looking for?” – when I said it was toothpaste, they pointed out the outfitter shop had small tubes there, so I was all set. Phew! My plan was to go up for 6 days and 5 nights. I wanted to spend time hiking, exploring, reading, writing in my journal, etc. I wanted to get away from people, from jobstuff, from my regular pattern of interactions and just be myself, with my own schedule, my own responsibilities, and just disconnect. I had the absolute support of my partner who understood I wasn’t running away from her, I was just getting away from EVERYTHING. So off I went. I trundled out of Mosaic around 2pm. Because I was planning on checking into Highlands Lodge on Sunday night, it was okay to show up for dinner there. On the off seasons, they serve ‘family style’ dinner promptly at 6pm, so I really needed to be at the lodge by then. Various mapping bits told me the trip would take about 2hrs and 45 minutes. So I should be good. The Jeep was all loaded up with my overnight frame backpack, my daypack, and a carry bag. I could comfortably carry everything in one trip. This was all I’d need for 6 days. The lodge was providing breakfast and dinner, and I brought along some Soylent for lunches. I also brought my skis, as I might be able to go to one of the local ski areas (Bretton Woods is within 2 miles of Highland Center, and Cannon Mountain is about 15 miles away). The drive up was unremarkable except for a few small bits. One, the GPS system in my Jeep is dreadful. It’s part of the uConnect system, which includes some crap software from Garmin. I’m going to need to replace it with something that can handle me saying “The intersection of route 320 and such and such a road.” – Nope, couldn’t handle ‘rt 320’ ‘route 320’ ‘rt. 320’ ‘320’ any of those. My lovely TomTom that’s 7 years old can do this. Pah! I ended up navigating parts of the trip using GMaps on my cell phone. Pahtui! Second, it’s been a long time since I drove through Franconia Notch. I went through just as it was getting dark, and the first views of Mt Lafayette looming overhead were a little disturbing. Across from Lafayette there’s a massive slope that can be imposing as heck. Yep, I was in the mountains. I made it to the Highlands Lodge after dark, pulling in a little after 5. Having absolutely no reference point to go by, I wasn’t sure if I’d see a little sign under a tree or a fully lit runway, but it turned out to be easy to spot, and I drove in, following the directions to checkin. The lodge turned out to be a relatively modern (about 10 years old), spacious, warm, and welcoming space. There were VERY few people there (at dinner, it was only myself and one other person, a pattern that repeated all week). The staff told me that over the weekend, they had over 210 people there. I couldn’t imagine the place bustling with a crowd… this quiet time was perfect for me. After dropping my stuff in my room, I had a lovely dinner, did a little journaling, then turned in for the night. My room was small but comfortable (a bunkbed with 2 bunks, the second one unoccupied, and comfortable, modern bathroom + shower down the hall. No problem). When I need to, I wake up at ‘the right time’. I never need to set an alarm, and this time was no different. The lodge had signs up all over the place stating that ‘quiet times’ were between 10pm and 6am, underlining that this place caters to hikers, who like to get out early and turn in early. Breakfast, therefore, was ‘when you like’ between 6:30 and 10am. I wandered downstairs at 8am and had a delightful quiet breakfast by myself (scrambled eggs, coffee, juice, coffee, toast, and coffee. I like coffee.) The weather was warm(ish) and damp, somewhere around 40 degrees. This was also my first look outside – it was misty and wet, but I was unquestionably in the mountains. It was lovely. After talking with the staff some more and purchasing a local USGS map of the area, I set out on my first hike up Mt Willard, about a 2 mile hike, up to 2,864 feet. The lodge was at 1900′, so this would be a good warm up hike / climb. The trail was right outside the lodge, so off I went leaving around 10am. things I’d need I already had – lots of non-cotton clothing, good boots, my still-awesome Lowepro camera-backpack, etc. But I had never outfitted for winter hiking. The one ‘new’ thing I bought was a set of Kahoona ‘microspikes’. These are strap-on rubber and chain and metal spikes for the bottom of your boots. 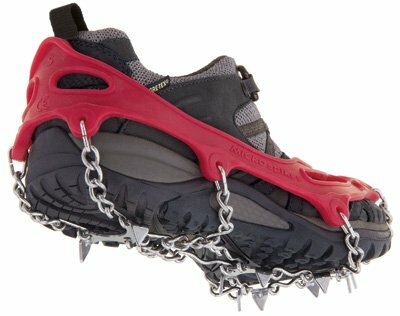 They’re far more aggressive than ‘yaktrax’ or similar items (you’d never wear them inside, or on pavement, or the like), but for a trail that is primarily snow and ice? They were completely invaluable. Once on, I wouldn’t even notice I had them in place, and I was able to walk up solid ice trails without a thought to slipping or losing my grip. Only once over 4 days of hiking did the microspikes slip, and that was on an easily > 45 degree slope of very hard clear ice. Unusual, and I was prepared for it. Monday, the hike up Mt Willis is best described as ‘damp’. I was surprised how quickly I warmed up, ending up just in my pullover, sleeves rolled up, etc after only 20 minutes 0n the trail. Total time up and back, about 3 hours, with the end result my boots were SOAKED. The trail was slushy as heck. I need to find a way to keep boots dry in wet weather. Fortunately, the lodge had a boot dryer, so I was able to dry them out in the afternoon I was back at the lodge and before dinner. I was pretty tuckered out from that hike, but it was worth it for the misty view of Crawford Notch once I was up there. Dinner back at the lodge was, the standard family style, this time with 3 other people. The meal was excellent (as was all the food), and after spending an hour or two journaling in front of the fire, I turned in early. Before I went to bed, I was wondering about a sound that had been sort of tugging at the back of my mind – it t was the the wind! A ferocious wind storm had come up in the evening, and the entire building was being buffeted by it. I’m guessing 40mph winds, snow, sleet, all the joyous sounds. It was oddly comforting to go to sleep listening to this going on, but I was certainly glad I wasn’t outside in it for the night. Another 8am wakeup, with some surely creaky muscles reminding me that I had done a lot of physical exercise the day before. The day turned out to be crystal clear, with the storm having blown itself out. Of course, crystal clear skies in the White Mountains in December usually means.. COLD, and today was no exception. Outdoor temperature was in the low to mid 20’s, and it wasn’t going to budge for the day. Buoyed by the good hike on Monday, I set my sights a little higher (literally), and decided to make a 4000 hike today. Now, in the northeast, there’s approximately 48 ‘4000 footers’ , and folks take great pride in ‘peak bagging’ all of them, the goal being to climb every one. The last time I climbed a 4000′ mountain was around 1980, when I was part of a backpacking trip in Maine. In that trip, I climbed several, but have done none since. At this point, I’d like to point out one other piece of gear that I was super-glad to have with me. Over the summer I found myself using my smartphone as a watch pretty constantly. The action of pulling my phone out of my pocket just to check the time seemed… weird once I paid attention to it (particularly in situations where that would be awkward, or I’d run the risk of dropping the phone), and I started thinking about a watch. Because of the aformentioned thoughts about camping and hiking, I hunted around and settled on the Pyle Multifunction Sports Watch. This had a large easy to read face, had a very good battery life, and had a bunch of functions I wanted in a camping watch. For my hikes, I found the best feature was the altimeter. I’d recalibrate it in the morning to the lodge’s base altitude of 1900 feet, and then leave it on the altimeter display for the entire hike (which also showed the time). From this, since I knew the destination altitude, I was able to see how far along on my journey I was. How much higher I had to climb, or how much further until I was back down at the lodge. Wonderful. Initially, I was going to go for Mt Tom, but in the end climbed up Mount Avalon (3,443′), and then climbed to the top of Mount Field (4327′). Again the weather was crystal clear, and cold, but the hike was absolutely amazing. Total time from the lodge to the top of Mt Field was about 3.5 hours, and let me tell you, that was not an easy climb. It wasn’t scrambling up rocks, but it was 3 and a half hours of steady, uphill, work. My microspikes kept me from sliding around, but it was hard work. I crossed several mountain streams, spent long periods walking uphill where I thought of very little, just… continuing. It was the detachment and physicality I was hoping for. Once on top, the view made it all worthwhile. Crystal clear views of the presidential range (including Mount Washington, only about 8 miles off), and just beautiful landscapes. During the hike up, I passed only one person heading down, but as I got closer to the top, I knew I was following at least 2 other people, because occasionally I’d hear snatches of conversations. I caught up with them right at the summit, and told them this was my first 4000 footer in 35 years. They were impressed. On top, I was… worn, but doing fine. It was quite cold, so i didn’t linger more than 15 minutes. On these sorts of hikes, if you stop moving, you start chilling very quickly, so keeping moving is critical. On the way back down, I passed the spur trail that led up to Mt Tom, and briefly considered it, but was a little worried about how tired I was getting, so decided to just head back down to the lodge. This turned out to be a very wise decision. After another hour of walking, I was feeling… punchy and a little spacy. I knew I was tired, but was feeling more wobbly than I ought to have. My watch told me I still had another 1100 feet to drop before I was back down, which seemed like a lot after having been on the trail for 5 hours already. Because of the snow, I hadn’t stopped moving or sat down for more than a minute or two the entire time, and I was worried I had hit my exhaustion limit. I started doing some mental exercises to keep me going. Counting footsteps (don’t look at my watch until I’ve counted a thousand steps). Doing calculations in my head (“Lets see, I’m probably doing 1′ per footstep, going conservative, so 1000′ is about 1/5th of a mile, the trail length is 1.8 miles…” etc etc), but the walk seemed interminable. I wasn’t in any danger, I just wanted to be done. I stopped at a stream crossing that I knew was relatively close to the bottom, and was caught up with by some other hikers I had also met on top of Mt Field. They pulled out some tangerines and had a snack while we rested, and I realized, stupidly, that I hadn’t eaten anything since breakfast… almost 7 hours earlier. The only thing I had taken in was some water an hour or two before (had to break through some of the ice that had formed in the bottle!) and nothing else. Finally made it back down to the lot next to the trail (where the happy guys who had passed me on the trail down were happily chugging good beer and yukking it up), had some good chatter with them, then staggered into the lodge. Total time on the trail: about 7 hours, 2 mountains climbed, and I was Wiped Out. I grabbed my jug of Soylent, chugged down a few glasses while warming and settling, then took a quick nap before dinner. Post-dinner I curled up in my bunk, turned on my laptop and watched a movie while letting my body go “THANK YOU FOR LETTING ME LIE DOWN”. Needless to say, Wednesday I woke up SORE. I had slept pretty well, and wasn’t groggy, just felt the creaky muscles that had been used pretty heavily the day before. I crawled downstairs fro breakfast by 9, because the weather was showing wet and rainy, and I sort of planned to stay in. Hiking in the rain is no fun. After breakfast, I went outside to just take a lap or two around the building and area, to work out some of the creaks. Saw the guys I had come up behind on the way to Mt Field, and they were on their way up the Crawford Trail toward Mount Pierce. We discussed the weather and the like, and as it wasn’t raining right then, they decided to head up, and, inspired by their “Heck, why not?” attitude, I suited myself up and headed up the same trail. Because I started so late (a little after 10), I knew I wouldn’t be able to make it all the way, but resolved to go as far as I could by 1pm, then come back down. I didn’t relish walking in the dark, and in the area, it started to get dark around 3:30, so I wanted to leave myself some time. Before I left, I borrowed a set of gaiters from the (remarkably well equipped) gear lockers at the lodge. This is all part of the AMC membership perk list, so I was happy to take advantage of their generosity. It had snowed during the night, and I really didn’t want to get snow in my boots. These helped keep the snow off my upper laces (though not the lower part of the boot) and keep me dry and warm. I also took hiking poles for the first time. There seems to be a fair amount of debate in the hiking community about the use of poles. I think for this type of hiking, where the ground is slippery, hard to see, and rocky, the poles give a huge advantage, in balance, leverage, and terrain usage. During summery casual hiking I could see them being a liability (one more thing to lug around with little benefit), but for the wintertime, they were great. On the way to Mizpah Springs Hut on the Crawford Trail goes from the Heartland Lodge toward the Zealand Lakes Hut (which I walked down on the way back from Mt Field). Not a difficult climb, but enjoyable. Again, I hiked for hours without seeing another person or hearing another voice. It was delightfully settling and comfortable. Because we had had some more snow the night before, I was following the footsteps of the previous 2 hikers, which made the trail easier. I assumed I was catching up with them, but by the time I had to turn around (at the split on the Crawford Trail that branches off to lead up to Mizpah Spring hut), I hadn’t caught up with them. This time, I brought another Clif bar, and remembered to eat it when I started feeling a little hungry. Hah, I can be taught! Total time on the trail, around 4 hours. I was back at the lodge by a little after 2, and suddenly had a strong hankering for something other than Soylent for lunch. I had been thinking of going to Bretton Woods to do some skiing (unfortunately the trail conditions looked awful), but I knew they had a real cafeteria. So I hopped in the Jeep and drove over there (less than 2 miles), and had a delightful couple slices of pizza, while scoping out the ski area a little bit. Looks like a nice place, I think I’ll try and ski there sometime. Back at the lodge, I took a brief nap, had dinner (with just one other person), and parked myself upstairs in one of the lounges to do a little gaming. Initially I was going to try and eschew as much tech / geeky stuff as I could for the week, but I came to the realization that what I wanted to get away from was not the technology nor the geekstuff, but get away from the responsibilities, pressures, and ‘needs’ that were a big part of my day to day life. Gaming helps me relax, so relax I did. I knew this was going to be my last day hiking. There wasn’t a ton of time on Friday for a prolonged hike, and I was feeling a little homesick. So, taking some advice from the lodge staff and another hiker there, I drove a little ways down 302 and hiked in to see Arethusa Falls. The hike itself was pleasant and relatively short (about 1.5 miles), and the falls were about half frozen. There was still the wonderful gurgling sound of water rushing down the rocks, but the ice had turned much of the flow to solid form. It was still beautiful, and I want to go back there during the summer to see it again. Total round trip: about 3 hours. After getting back to the lodge, I was feeling super-restless, and wanted to go hike more, so I immediately went back up to Mt Willard – where I had hiked on Monday. This was also a sort of benchmark for me. This was day 4 of being on the trails, how had my body changed / strength increased? It was also beautiful out, and I wanted to take some new pictures from the heights. Back on Mt Willard, beautiful weather! The result? The climb was almost a cakewalk. I was warm and working, but didn’t feel particularly winded or pushed. This was the exact same hike I had done 3 days earlier, but now I was better conditioned and stronger. Total victory! The views from up top were, again, spectacular. Dinner back at the lodge was pleasant and busy. A new crew was coming in for the weekend, and the place was almost hopping with activity. Many of the people coming in were AMC staffers up to the lodge for a meeting, and I had a lovely dinner with 2 folks (one of them knew one of my neighbors through cohousing connections!). Had a lovely dinner, and afterwards retired to the lounge to write in my journal, then read in bed for a while before conking out at almost midnight – very late for me, but feeling very contented. Last day of ‘vacation’. Or at least of time in New Hampshire. As expected, I really didn’t get the opportunity to get in any hiking in the morning, heading out from the lodge after eating breakfast and packing up my room. Getting back home felt like where I wanted to go, so I headed out onto the road. I made it out to 93 and started to pass by Cannon Mountain, when I had the urge to pull in. I hadn’t skied at Cannon in a long time, and this seemed like the perfect opportunity. I unshipped my skis, bought a lift ticket ($38 for the day – that’s remarkably low!!!) and hit the slopes. Finally, at around 1p, I was back on the road and headed back home, getting there in time to see close friends and settle in. This was quite an excursion for me. I wasn’t sure what spending that much time alone would be like for me. I mean, I’ve travelled alone before, but this was different in that it wasn’t just an absence of people I knew, it was an absence of people in general. Over the space of 5 days, I saw a total of perhaps 10 different people, none of whom I knew. I kept my social distance wanting to be left alone. Will I do this again? Yes, I think I will. I think it was an excellent brain-reset. It was physically demanding, which was great for my body (even though, durnit, after 4-6 hours of heavy exercise every day for a week, I ended up losing… 1lb. Not a top notch weight loss program, but then again, that’s not why I was doing it. This was physically hard on my body. I have blisters on the backs of both my ankles (I suspect from the tight strap of the microspikes. I use these boots for many things, they’re well broken in, and never had a blister problem). I also apparently scratched the bejeezus out of the top of my right foot while sleeping (something I do during very dry weather). I scraped it raw and have had to bandage it the last few days. Muscle and body wise, I feel fine, short of a very healthy appetite. This was good for me. Emotionally and physically. Financially? If you’re ever considering a vacation, please consider joining the AMC and visiting their lodges. This entire stay, including 2 meals a day, from Sunday to Friday, cost me only $360.